Hello, and welcome back to our blog here at Furever Bookkeeping. 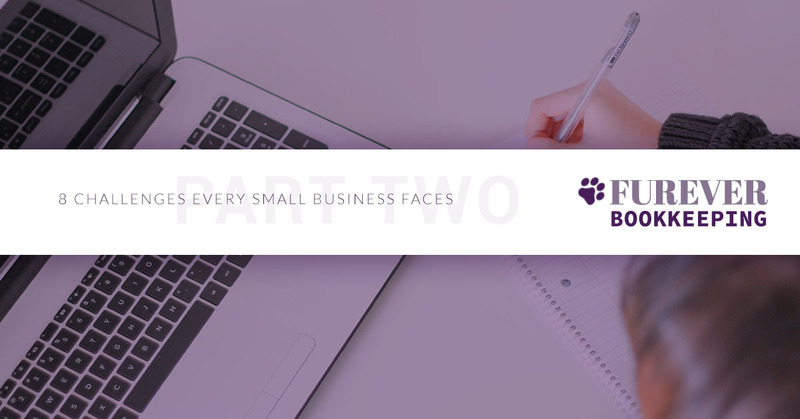 This is part two of our three-part blog series about eight challenges that every small business owner will face. It’s important to start thinking about these challenges so that once it comes time to deal with them, you have some type of plan and know what options are available to you. If you didn’t read our first blog, you can view it here. Many people become resistant to the idea of using or incorporating new technologies into their business. Business owners often become “set in their ways” when it comes to the way they use technology. And even though they might realize a need for new technology, they either don’t want to spend the money or they don’t want to put in the money to implement a new system. However, there are some great programs out there that can help you manage your business, whether it’s for scheduling, finances, or programs such as Skype that allow you to have long-distance business conferences. Chances are, if you have a need, there’s a program that can help you with it. Accurate financial reports – You may have already tried creating financial reports on your own with no luck. However, with a professional bookkeeper, you won’t have to worry about previous mistakes that you or an employee made in your books. Many bookkeepers work retroactively to repair your books while creating up-to-date financial reports helping you plan for the future of your business. Manage cash flows – Running a successful business is difficult enough, so why would you make it harder by managing all your company’s transactions by yourself? Without a reliable bookkeeper, you’ll might be overdue on payments or forget what payments are due to your company. This will inevitably lead to a loss in revenue and potential legal ramifications. Tax planning – There’s no understating how important it is to know your financial situation when it comes to tax planning. Many companies don’t understand the importance of filing their tax returns accurately and on time every year. And if you don’t have that base understanding of your company’s annual revenue and overall financial situation, you risk running behind on your taxes. There’s no better time to call your expert bookkeepers at Furever Bookkeeping. With over fifteen years of experience as master bookkeepers, we will be able to accurately manage your cash flows, provide weekly and monthly financial reports, and help you plan for your financial future. The sooner your speak with a dependable in-house bookkeeper, the sooner you can take your financial security back into your own hands. Contact Furever Bookkeeping today to learn more.